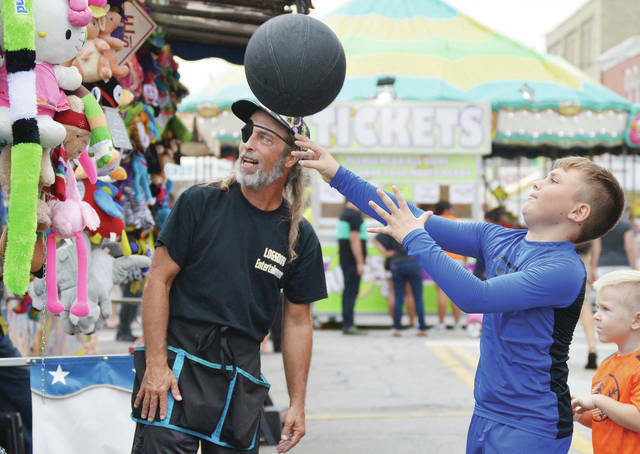 Amber Waters, left, 13, daughter of Kim Water, grabs a piece of Jayden Ferryman’s, 13, both of DeGraff, daughter of Jennifer and Todd Allen, blooming onion at the DeGraff Country Fair Saturday, Aug. 25.
Cooper Crouch, right, 9, of DeGraff, son of Brooxie and Zarah Crouch, takes a shot at the booth run by Jim Logsdon, of New Lebanon, at the DeGraff Country Fair Saturday, Aug. 25. 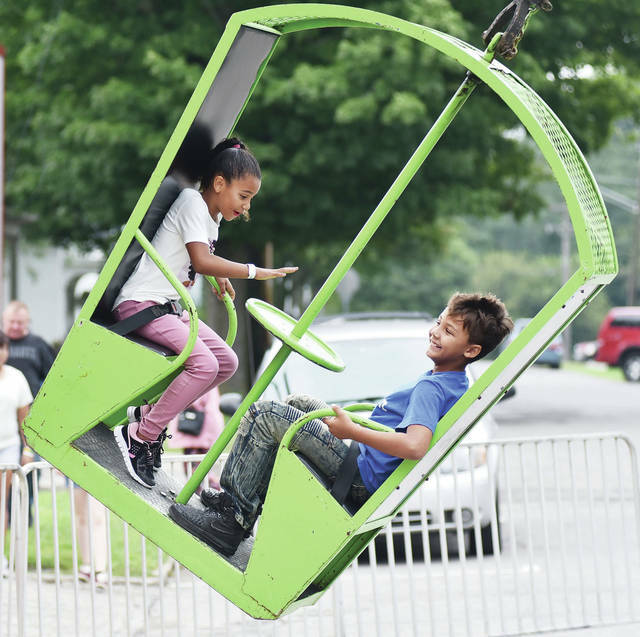 Taraji Johnson, left, 6, and her brother, Tyrin Johnson, 7, both of Bellefontaine and the children of Sara Holycross, ride the “Frolic” at the DeGraff Country Fair Saturday, Aug. 25. 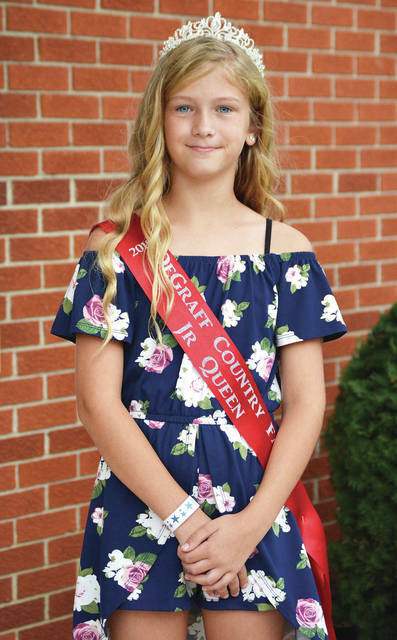 Zoey Ransbottom, 10, of DeGraff, daughter of Colby Ransbottom and Emily Inskeep, was crowned 2018 DeGraff Country Fair Junior Queen at the DeGraff Country Fair. 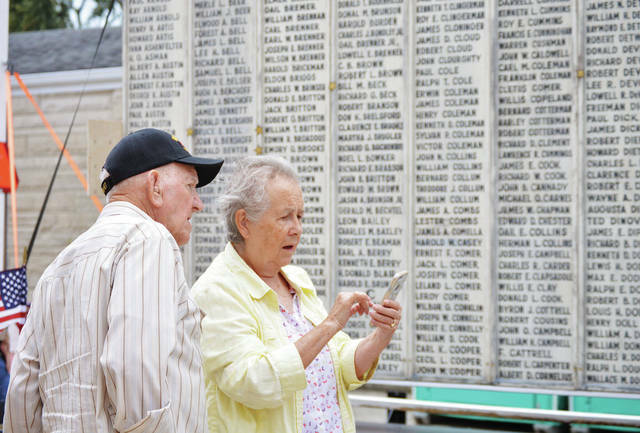 Vietnam veteran Willie, left, and Phyllis Burkhammer, both of Russells Point, try to get pictures of relative’s names that are written on the Logan County Roll of Honor behind them. The names are of Logan County residents that served in World War II. Phyllis had four brothers serve during WWII and her father served in World War I. American Legion Post 173 refurbished the roll of honor which had fallen into disrepair. 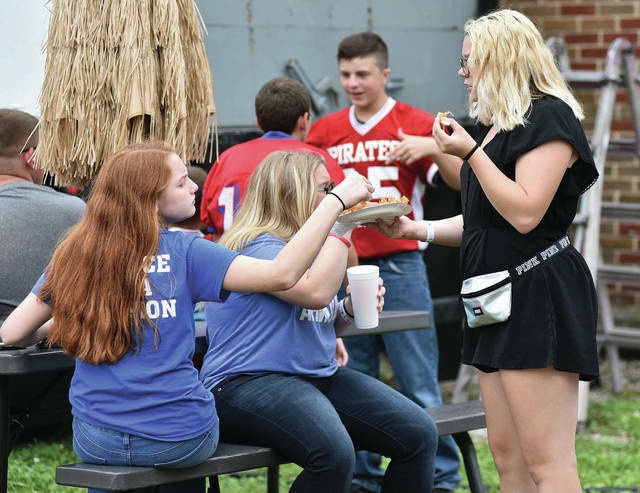 The roll of honor was displayed at the DeGraff Country Fair Saturday, Aug. 25. 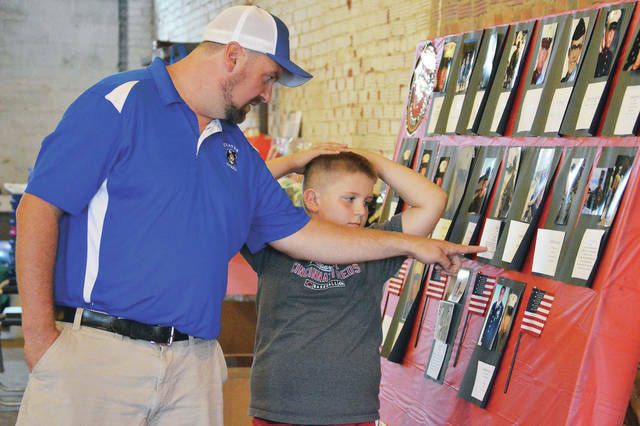 U.S. Navy veteran Clint Schindewolf, left, looks at the Memorial and Honor Wall with his son Cole Schindewolf, 9, both of Quincy, at the DeGraff Country Fair Saturday, Aug. 25. The wall is hung with pictures of locals who have or are currently serving in the military. Schindewolf had a photo on the wall. Cole is also the son of Ashley Schindewolf. 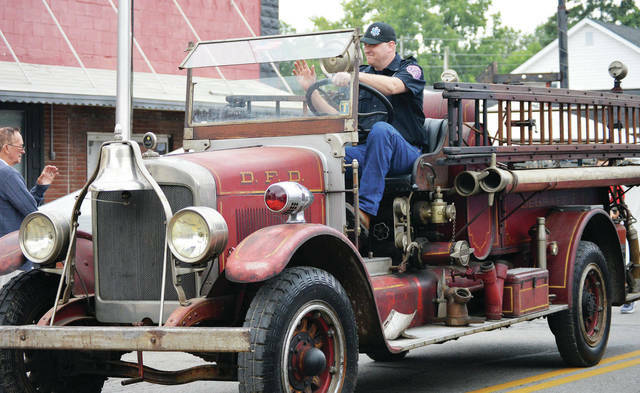 DeGraff firefighter Daryl Cordrey, of DeGraff, drives the DeGraff Fire Department’s 1927 Pirsch fire truck at the DeGraff Country Fair Saturday, Aug. 25. 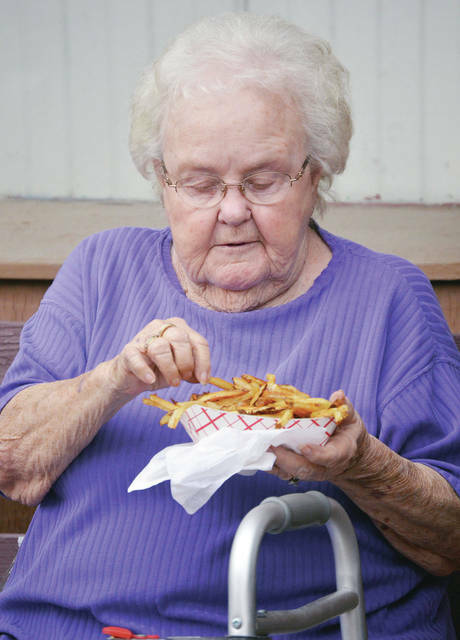 Marjorie Faulder, of DeGraff, eats french fries at the DeGraff Country Fair Saturday, Aug. 25. 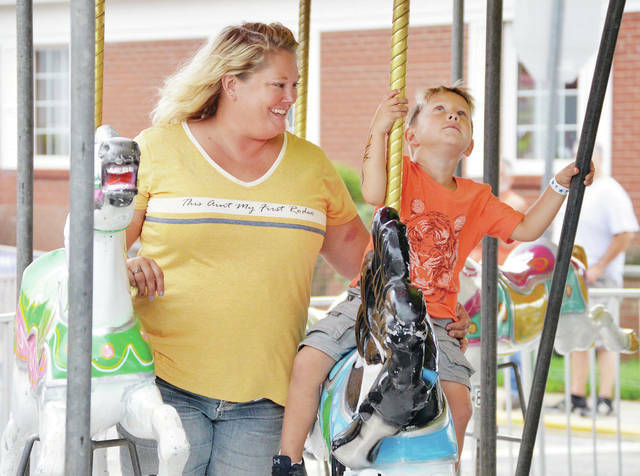 Cathy Platfoot, left, rides a carousel with her son M.J. Platfoot, 3, both of Maplwood, at the DeGraff Country Fair Saturday, Aug. 25. M.J. is also the son of Scott Platfoot. 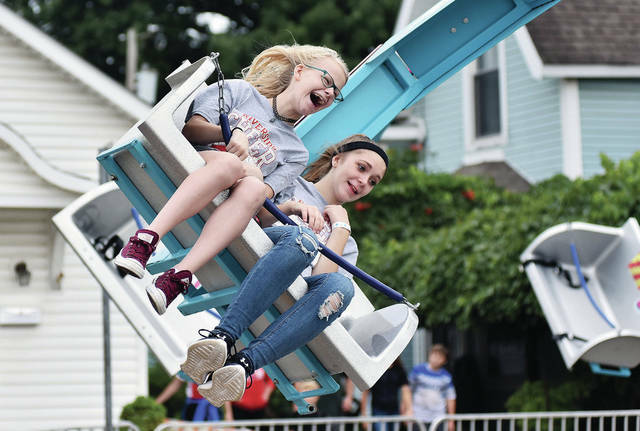 Hailey Noggler, left, 12, of Quincy, daughter of Kayela and Shawn Noggler, and Makayla Mees, 12, of DeGraff, daughter of Amanda and Jason Mees, take a spin on a ride at the DeGraff Country Fair Saturday, Aug. 25.